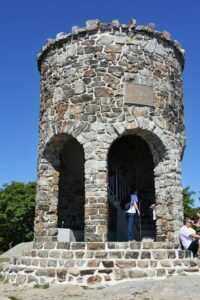 Hiking for Hemophilia – LA Kelley Communications, Inc. Yesterday was a beautiful, sunny, crisp fall day in New England, and perfect for a hike. 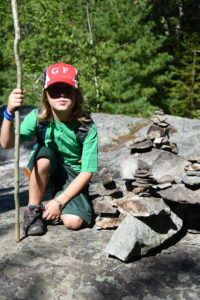 Hiking is even better when you can hike to help! 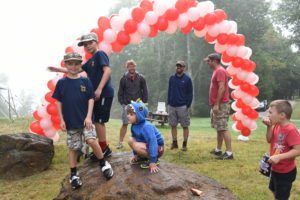 The Hemophilia Alliance of Maine (HAM) hosted its fourth annual Hike4HAM, at Camden Hills State Park, where we would hike up Mt. Battie. 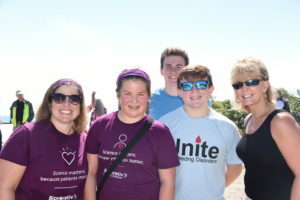 A one-hour hike up offered spectacular views of Penobscot Bay, a way to earn a great lunch, and enjoy the company of our “family,” the hemophilia community. This was really special for me. For years I’ve been promising the dedicated staff at HAM I’d try to make their walk, or hike, or annual meeting. Something always came up that interfered with that plan. But Saturday, September 15… all clear to go! Doug and I drove the three hours to Camden Hills, enjoying the New England scenery and quaint towns. Maine is an absolutely beautiful state, “The Way Life Should Be,” as its slogan says. I didn’t think I knew any of the families. 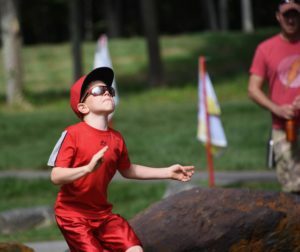 One of the reasons HAM was founded is that it’s so difficult for Maine families to come to the New England regional events. Although New England is significant in size, a combination of six states, we really do have our own cultures. Massachusetts is different than Maine, which is different than Vermont or even New Hampshire. I was looking forward to meeting new families and maybe connecting with some who might be on our mailing list. Families were grouped in teams, usually with a name of a family member with a bleeding disorder, like “Team Thomas.” Industry reps were there with tables of product info and giveaways, and donuts! It was fun to connect with known friends like Sandy (Octapharma), Tommy (Novo Nordisk), Ron (CSL Behring), Lisa (Bioverativ) and Victoria (Aptevo). And to see Jill Packard, president and founder of HAM. As we started our hike in the chilly air, it progressively got warmer as we moved, and I fell in to chatting with an adorable 10-year-old named Emery. A long time ago I seemed to have more time and focus to chat with families, and got to know so many through these past 30 years. As we hiked, I loved asking Emery all about his hemophilia: he has hemophilia A, he told me–“…that’s factor VIII.” And he self-infuses–impressive! His little brother Hamilton has hemophilia too. Watching Emery I was impressed at his stamina, and absolutely no joint damage. You would never know this child has hemophilia. He jumped off a boulder, landed hard and kept hiking! 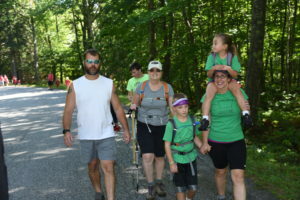 Families hiked in teams, and through the woods came moms, dads, uncles, aunts, friends, grandparents, lots of children and even dogs! An hour later, we were rewarded with a view of clouds… we were above the cloud and fog line, which obscured the bay but still made for a worthwhile climb. As did the fundraising: HAM raised about $20,000 on this hike, which we were proud to contribute to–I even got a medal for being one of the top donors! After the hike we had hamburgers, corn on the cob, potato salad and lemonade. I sat with folks I didn’t think I knew, but as we shared names, they knew me and shared stories of how my book Raising a Child with Hemophilia had helped them, especially back in the days long before HAM was founded. One mom told me RCH and our newsletter PEN were the only connections she had with the hemophilia community. That was so sweet to hear! And with HAM, she is now well connected. Congratulations to Jill and team for creating HAM, for holding the hike, and for all the participants, particularly the industry reps who give up so many weekends to participate in our local events. I hope to hike next year too!